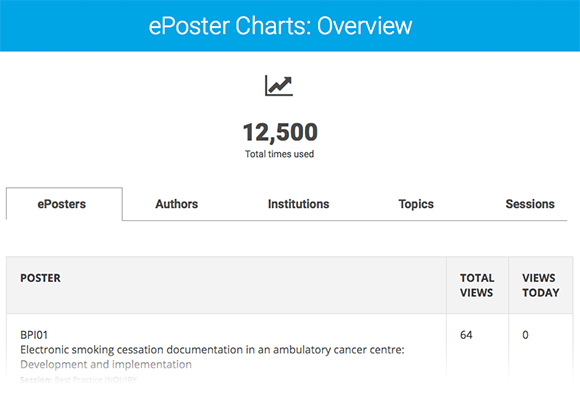 Home With ePosterCharts, you now know how engaging is your poster program. And much, much more. of your poster program. And this is all thanks to the smart design of ePostersLive®, which differentiates the system pages for ePosters, authors, institutions, topics and sessions. Most conferences choose to have their ePosters published online – with the consent of their authors – during and after the end of the event. The benefits of having those ePosters published online as well, are multiple. 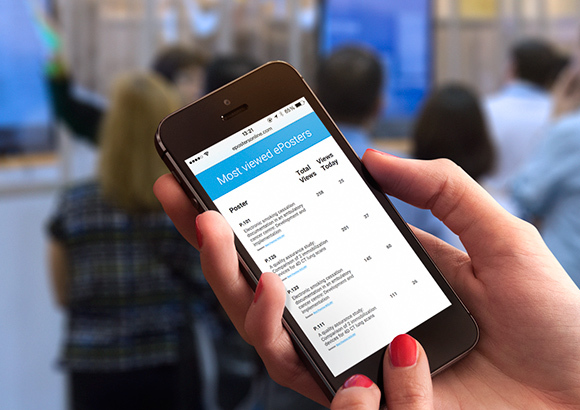 Another great thing about ePosterCharts™ is the insight they offer is available for both your on-site program, as well as after that, for the online ePoster archive dedicated to your conference. Statistics collected and presented via ePosterCharts™ are compatible with any kind device. Therefore, the scientific committee and anyone else that needs to, can access those via laptop, smartphone or tablet, anytime during and after the conference. ePosterCharts™ comes bundled with ePostersLive® at no additional cost. To find out more about what ePostersLive® can do for your meeting, get in touch with us for a free 45-minute GoToMeeting demo or a quote tailored to the size of your poster program.